I went to Noosa in Australia to go to the Gympie Muster, a big country and western festival. Hundreds of people travel to it from all over Australia and from other countries every year. We saw some strange sights, like the spa pool that had a TV on the back of it that was on the back of a ute and a green frog drinking out of the toilet! I enjoyed listening to the singers. To my surprise John English was there – he is my favourite singer. Last time I saw him perform live was in Jesus Christ Superstar. Everyone was so friendly at the Gympie Muster – not sure if it had anything to do with our fantastic tee shirt that we had made. 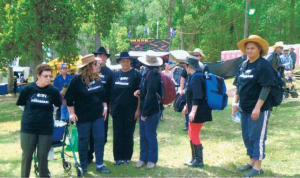 The logo said Kiwi Wanderers on the front and Gympie Muster 2014 on the back. I got to know my friend Gillian a lot better as we shared a room on our travels. Thank goodness for Navman that was on Camp Mother’s (Margo’s) phone that directed us around to our destinations. Otherwise we would’ve been up a creek without a paddle! We went to the Eumundi Markets where I brought myself a watch with bling, a lovely top for my mum and earrings for a friend. The atmosphere there was vibrant. Had a coffee with the girls as well. We stayed at the Australis Noosa Lakes Resort Apartments where there were three pools and a BBQ area. The water in the pool was lovely and warm. For our dinners we had BBQ, pizzas, homemade spaghetti Bolognese, hot chicken with potato salad and green salad. We also made our lunches every morning before we went on our trips, with assistance from Camp Mother and Camp Leader (Wendy). I have been to Australia Zoo before; it was a lot different then. The zoo has got a lot bigger – it used to be the size of the staff carpark. This time there were a lot more animals like giraffes, zebras, seals, red pandas, tigers and giant tortoises. SeaWorld was a great day too – we enjoyed the parade of SpongeBob SquarePants and watching the polar bears. The trip was well worth the savings and tasks that were required for this experience. The best trip I’ve been on in my life, it was a fantastic experience. Would do it again at a drop of a hat!